Marketed as a soap for the greasy mechanic, gardener or man in your life, Beessential Mechanic’s and Gardener’s Soap is truly fit for anyone who could use a little extra full-body exfoliation. 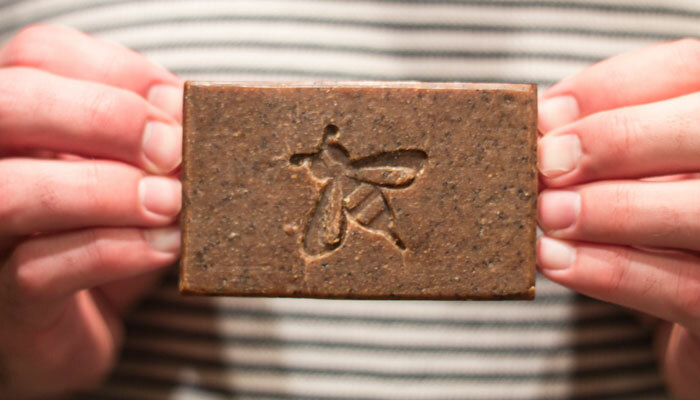 Thanks to the power of coffee grinds, Beessential Mechanic’s and Gardener’s Soap delivers an exhilarating scrub that’s especially ticklish on your feet and preps the skin for whatever moisture you choose to drench your skin. Saponified Oils of: Coconut, Olive, Palm, Shea Butter, Beeswax, Coffee, Cocoa Powder and Coffee Essential Oil. Because of the intense color of coffee grinds, Beessential Mechanic’s and Gardener’s Soap does leave your shower with a tinge of brownish-caramel coloring. If you’re a bit of a neat freak, beware. The color runoff collects in the built-in soap dish of the shower, so you may be wiping that off a little more than usual when you use this soap. It doesn’t stain, though, and it doesn’t affect anything on your skin — anyone who has ever used a coffee body scrub knows how much of a mess it can be! Oh the things we do for soft, exfoliated skin. I enjoyed using this soap after weeks of travel where I just wasn’t great about exfoliating. It left my skin feeling invigorated and clean without stripping moisture. The texture, though, can feel a bit scratchy if you aren’t used to heavy-duty exfoliating soaps. This definitely isn’t one to use on your face! While I enjoyed using this soap, it’s not a must-have for me because I do prefer to exfoliate using body scrubs and polishes. It is, though, a nice one to have on hand for travel, as it’s a solid and can help you keep up your exfoliation game while on the road. And of course, if you do have a greasy mechanic in your life, he or she may just love how scrubby this soap is! How do you clean up coffee scrub residue in your shower? Do you prefer exfoliating soaps or body scrubs and polishes? Where are all my greasy mechanic readers? Tell me what you know in the comments section.